The Netherlands are looking beyond segregated infrastructure and the problems that arise when too many people are cycling! 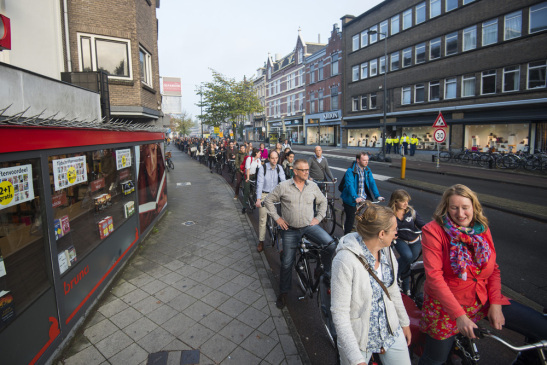 It was in the news again: Dutch cycleways are getting overcrowded. It was not the first time this made headlines. I have shown you “bicycle traffic jams” before. In 2014 there was one in Utrecht that became famous and already in 2012 you could see one in Wageningen. But this phenomenon is not just mentioned in news items, the Dutch road safety board SWOV recently published the results of their investigation of how busy cycleways really are. They confirm: half of the investigated cycleways are getting too busy during morning rush hour. Of course Dutch experts have already picked this up, trying to find a solution. That seems very simple: there should be more space for cycling. But how do you give cycling more space in an already full urban space? One answer could be: design the city in a completely different way. Previous PostEcology of cycling – the cyclist you designNext PostTowpath work due to start end of February.